Are You Safe from the War on Cash? Although you won’t hear it in the mainstream media, many world governments want to eliminate paper cash. Governments hate paper cash because it’s hard to track. Electronic payments through banks are much easier to monitor and record. Nick Giambruno, editor of Crisis Speculator, has been following this trend closely. Nick went on to explain that the U.S. government imposes restrictions on withdrawing your own cash from the bank. They all end with more government intrusion into your financial affairs. Thanks to these made-up wars, the U.S. government is imposing an increasing number of regulations on cash transactions. Try withdrawing more than $10,000 in cash from your bank. They’ll treat you like a criminal or terrorist. The world’s largest printer of banknotes (paper currency) is cutting production and firing employees. Yesterday, De La Rue (LON: DLAR) announced it will cut its banknote production capacity by 25%. The company is closing half of its production lines and eliminating 300 jobs. De La Rue prints more banknotes than any other company in the world. It produces banknotes for over 150 national currencies, including the British pound sterling. Its stock price is down 20% since mid-April. De La Rue may also sell its cash-sorting machine business for similar reasons. I think you'll be surprised just how easy this is – yet most Americans know nothing about this option. You don't even have to send a single penny outside the U.S. to do it, either. Click here to learn more. Your broker or financial advisor will never tell you about this little known financial website that's helping some people make up to $300 per hour. Learn more here. We suggest owning a significant amount of physical gold and silver. People across the world consider gold and silver money. They have for thousands of years. If your government eliminates paper currency, you won’t be able to store wealth by keeping cash at home or in a vault. You’ll have to store all your cash in digital form, at a bank, or another financial institution. With gold and silver, you can store a portion of your wealth at home or in a vault, outside the banking system. And, unlike cash in a bank, reckless government printing and spending can’t destroy the value of gold and silver. You should also consider reading Casey Research’s newest book, Going Global. It includes strategies to protect your money from reckless government actions, like the banning of paper cash. We typically sell this book for $99…but right now we’ll mail a hardcover copy to your front door for just $4.95. Click here to learn more. Brazil’s economy shrunk by 4.5% during the third quarter, according to government data released this week. It was the biggest quarterly decline since Brazil starting keeping GDP records in 1996. Its economy has now shrunk three quarters in a row. Since July 2014, Brazil’s currency has lost 41% of its value against the U.S. dollar. Meanwhile, Brazil’s annual inflation rate just topped 10% for the first time in 12 years. And the country’s unemployment rate hit a six-year high of 7.9% in October. China’s economy grew 9.7% per year from 1990 through 2014. In 2010, China became the world’s second-biggest economy. During this time, China’s explosive growth helped boost the global economy. China needed a lot of raw materials to build its infrastructure. This helped countries, like Brazil, that export those materials. In fact, China’s rapid growth helped Brazil become the seventh-largest economy in the world. That’s more than it sends to any other country…and nearly twice as much as it sends to the U.S.
China’s slowing economy means it’s building fewer factories, office buildings, and bridges. That’s hurting demand for Brazil’s largest export: iron ore, the main ingredient in steel. Iron ore accounts for 19% of Brazil’s exports. It’s by far the country’s largest export. According to The Wall Street Journal, spending on capital goods fell 3.8% during the first 10 months of 2015. Capital goods include equipment and machinery. Meanwhile, business investment only grew 2.2% during the third quarter. That’s one of the smallest increases since the Great Recession, according to The Wall Street Journal. The energy sector is a big reason those figures are so weak. As you likely know, energy prices have plummeted. The price of oil has dropped 40% over the past year. And the price of natural gas has dropped 34%. Energy consulting firm Wood Mackenzie estimates that North American oil companies have cut spending by $220 billion since last summer. On Monday, The Wall Street Journal reported that companies in other sectors are dialing back investments as well. Even major retailers are cutting back on spending. Macy’s Inc. plans to close 35 to 40 stores early next year, joining J.C. Penney Co. and Abercrombie & Fitch Co. among retailers announcing cutbacks this year. Companies buy more equipment and machinery when they’re optimistic about the economy. They cut back on spending when they think the economy is slowing. Right now, declining business investment is one of many signs pointing to a slowing U.S. economy. Today’s chart shows Vale’s adjusted stock price, which accounts for stock splits and dividends. Its stock price has dropped 57% this year. It’s now down 89% from the all-time high it set in 2008. 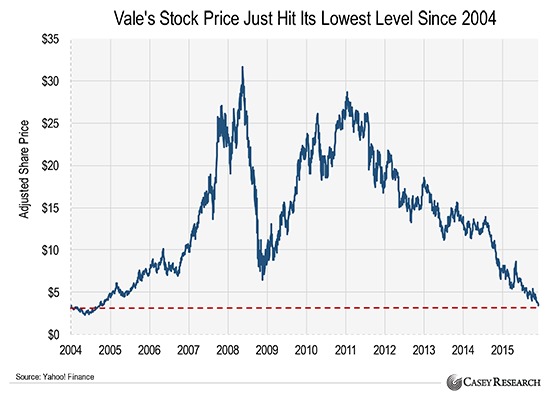 Vale mines more iron ore than any other company in the world. Its stock price is crashing because iron ore demand is crashing. This points to huge problems in the global economy. If you have a question or comment, please send it to [email protected]. We read every email that comes in, and we'll publish comments, questions, and answers that we think other readers will find useful.